This novel has already hit The New York Times best-seller list, and no wonder. THE PARIS WIFE. By Paula McLain. Ballantine Books. 320 pages. $25. You might wonder why Paula McLain would write a novel about a subject that has been so thoroughly covered by other writers, but I am delighted that she did. The Paris Wife is a fascinating, engrossing story – the sort of book that ends before you’re ready to bid the characters farewell. The subject is the marriage of Ernest Hemingway and his first wife, the first of four, the one with whom he spent those giddy, intoxicating early years in Paris before he left her behind. Hemingway himself has written about his relationship with Hadley Richardson Hemingway in A Moveable Feast, and others have written her biographies or written about her in biographies and studies of Hemingway. So, you might have thought that there was not much left to say about this important but doomed romance. But, as she explains in a note at the end of the volume, McLain wanted not to duplicate those accounts, but to delve more deeply into the emotions at play in those dramatic, heady times. Particularly, McLain was intrigued by what was going on in the heart and mind of Hadley, for this book is told in the first person from her point of view. McLain does a fine job of retelling a story whose broad outlines are familiar to many, adhering faithfully to the facts. But she does so much more, creating something entirely original, an insightful, touching, compelling story of what it was like to be an intimate part of the life of a man who felt destined for something larger than ordinary life. Hadley was 28, the quiet, inexperienced daughter of a well-to-do St. Louis family. Her father had committed suicide, and Hadley had nursed her mother through her last illness. When she met Hemingway at a Jazz Age party while she was visiting friends in Chicago, she thought of him as a “beautiful boy.” He was 21, full of tales of adventure from his days as an ambulance driver in World War I. Though she felt plain and dowdy compared to most of his acquaintances, Hadley enchanted Hemingway. He wooed her with letters, swept her off her feet and married her within months. Already, he was determined to be a famous writer, and soon settled on Paris as the place where he would make his breakthrough. And there they were immersed in the Lost Generation. Through Hadley’s eyes, we see a life where so much was outsize – too much partying, too much drinking, too much passion, too much freedom. It was wonderful, and it was terrible. Gertrude Stein is here, and Scott Fitzgerald and his crazy wife, Zelda. Real people we have read about in histories and biographies dance and drink, fight and love through these pages – including, of course, Pauline Pfeiffer, another well-to-do girl from Saint Louis, who starts out as Hadley’s friend and ends up as more than a friend to Hemingway. It’s fascinating to see Hadley’s beautiful boy as he transforms himself into the great author and adventurer, by sheer force almost as much as by talent. Hemingway is driven by a sense of his own destiny that overwhelms everything else, including his very real love for and need for Hadley. Hadley, meanwhile, deeply in love, tries to keep up with him, overlook his many faults and meet his needs without completely losing herself. Her struggle becomes more difficult after the birth of their son. She fears that even though Hemingway loves her, he sees her as holding him back, a drag, too dull, not inspiring. She fights for her marriage until she cannot fight anymore. This is a story about how love, even deep, real love, sometimes is not enough. It is a story about genius and fame, and the toll they can take not only on the gifted one, but also on those who love him. It is a story about the conflict between legend and real life. Ernest Hemingway’s unforgettable voice told us his stories of life, love, betrayal, courage and heartbreak. 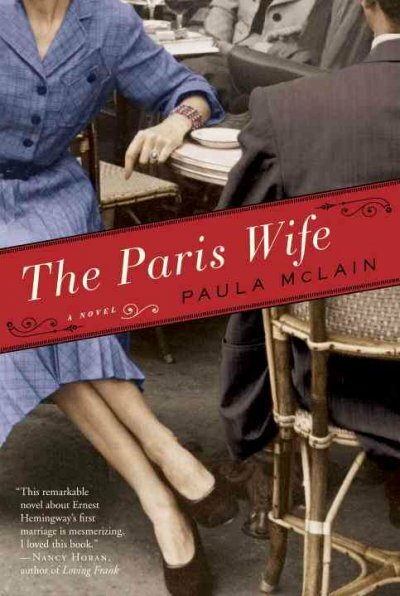 Now Paula McLain has given Hadley, the Paris wife, a haunting, lyrical, brave voice with which to tell her stories. This entry was posted in Contemporary literary fiction and tagged fiction, Hemingway, Paula McLain. Bookmark the permalink.